It’s a form of a simple partner role-play set up usually with long lines of people shoulder-to-shoulder, facing another similar line so that each participant has one partner to work with across from them. Each person is directed to interact only with that partner, no matter what insanity erupts nearby. A quick scenario or stage setting is given to the whole group, and then each line is assigned a specific role within that scenario — with the disclaimer that it may be incomplete, so those participating in the role-play are empowered to improvise during the 90 seconds or so of action. After giving participants a few moments to get into their roles, the facilitator says, “Go!” (Fill in the blank with the specific instruction — knock on the door, interrupt the meeting, approach the authority, etc.) Then cacophony reigns. 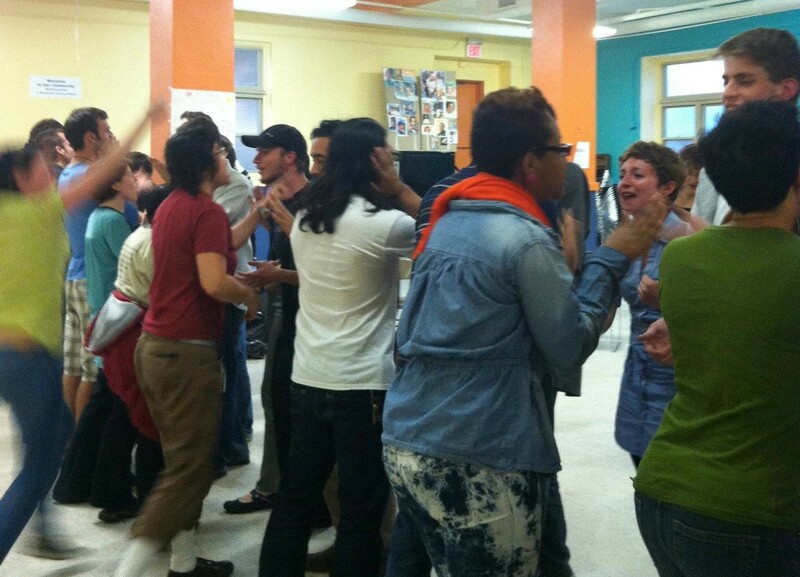 The facilitator ends the role-play by shouting, “Freeze!” or “Stop!” or by whistling, then instructs folks to check out their positions, then release the energy — big breath in, let it all out… and step away from the other line. The debrief that follows the action is critical to the effectiveness of any role-play. Ninety seconds of hassle line might take 10 to 30 minutes of debriefing to pull out all the lessons. I recommend, however, limiting debriefing times to 10 minutes or less between hassle line actions to keep energy up. There is no need to draw all the lessons from one round. Instead, it’s best to try several scenarios, switching the roles of the aggressors or activists from line to line and making the participants change partners. 10. They’re easy to set up: It’s entry level to addictive role-plays — easy to use, easy to teach people to use and forgiving compared to complicated role-plays with many moving parts. 9. They can be done anywhere: Hassle lines can be executed in confined spaces. They can be done in short or long lines, concentric circles, or in scattered pairs. In fact, a small space will often up the energy level of the role-plays themselves. 8. They’re quick: This exercise can be done quickly when time is short. Make sure to set the lines up before you give the scenarios or roles out. 7. They can be adapted to any issue: There is endless variability of content, from conflict deescalation in a direct action setting and canvass door knocking to media interactions and family dynamics. 6. They can be used for both practice and exploration: They can be set up to practice specific tools, or, to provide time for exploration of responses. 5. They’re entry-level: As far as role-plays go, these have a very low bar for participation — you just interact with one other person in the midst of many, so fears of performance are limited. 4. They’re accessible popular education: They are a great way to introduce the basic framework behind experiential education that includes the “Experience, Reflect, Generalize and Apply” structure. 3. They lend perspective: They offer opportunities to step into another’s shoes intentionally and easily. 2. They’re interactive: Since everyone is playing, there is high participant involvement. If there are odd people out or anyone who insists on standing out, simply have them take notes on the behavior of the actors. 1. They’re fun: Because everyone is involved, and because these are quick and dynamic, they build energy. To take advantage of these top 10 reasons, there are some key principles that must be followed when setting up hassle lines in order to get what you want out of them (and most of these are true about any exercise or tool you would use in a workshop). First, match the goal of the training and the scenarios you use. As a facilitator, consider the answers to the questions: What is the objective for running this exercise? For each specific scenario? What are the take away learnings for the participants? If you are running a hassle line to explore conflict, your scenario should not force certain behaviors in the role play. Let the participants decide whether to escalate, or deescalate when faced with the issue. If you are interested in having it become (painfully) clear which responses or behaviors support effectiveness of your action, for example, then it helps to state clearly the agenda for the activist line in the scenario you delineate. Use pointed debrief questions to be sure that the desired takeaways are articulated. Prime the group so that they are ready to jump in. I always ask some kind of call/response question to break the ice, to help them get over a reluctance to make noise that is sometimes present in the room. I expect the group to yell out, and, if not enough of them respond, I repeat this until they do. As facilitator, it helps to note specific behaviors that are exhibited during the role play in relation to the desired objectives and takeaways to help the debrief be as effective as possible for the specific scenario and group’s needs.